WAKE THE DEAD has wowed concert and festival crowds from San Francisco's Fillmore Auditorium to Eugene, Oregon. National radio play and concert tapers are spreading the music wider every day. 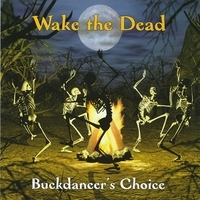 The first album is a huge success, and the second, Buckdancer's Choice, will hit the stores soon. During the next two years, the band's repertoire has quadrupled, including rare Robert Hunter songs never done by the Dead, traditional songs that helped shape Jerry Garcia's career and, increasingly, original compositions by Wake the Dead bandmembers. New material and new takes on classic numbers are being added all the time. The new arrangements are richer and more adventurous than those on the debut album. The band, now numbering eight with the addition of Brian Rice as second percussionist, takes advantage of the strengths of each member, establishing more thunderous grooves, more interesting textural shifts, and more and more stepping out into dangerous improvisational territory. Where the first CD was born around the kitchen table, the second CD was born on stage, growing in intensity and complexity as the band grows tighter and more confident in front of bigger and bigger crowds. Where will the road take Wake the Dead next? Your guess is as good as ours, but it's bound to be one amusing trip. If your a fan of the Dead and enjoy traditional irish music then you will love this. The Scarlet Begonias is awesome! If Jerry Garcia's middle name had been Flaherty, the Dead would have sounded like this. This is a brilliant recasting of some great tunes into the modern Irish style. It ranges from a respectful cover of "Uncle John's Band", where the Irish licks sneak out like a little kid peeking out from under a blanket, to a joyful blend of traditional Irish tunes supporting favorite Dead songs like "U.S. Blues". If you're a fan of either the Grateful Dead or modern Irish music, this CD is far too much fun to miss.